Enter the students emails yourself into the class list. 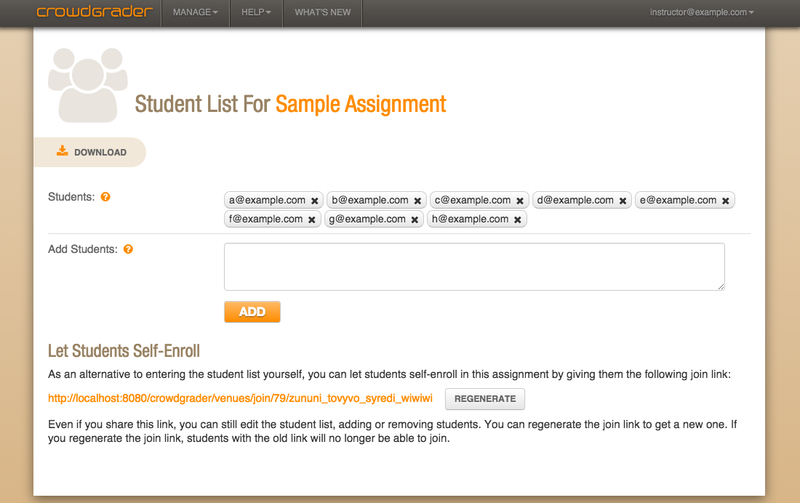 Or, you can let students enroll by giving them the join link displayed on the page. When students self-enroll, they receive an email message reminding them of the account they have used to enroll. All emails need to be Google account emails. Emails of the form user@gmail.com and user@googlemail.com work, as do emails that belong to Google Apps (such as Google Apps for Education, or Google Apps for Work). Every assignment has its own student list. When you clone an assignment, you create a duplicate of the student list. If you clone an assignment, and then add a student to the original assignment, the student will not be added to the clone. If you remove a student during an assignment, the student will no longer be able to submit or review, and her or his submission will no longer be assigned to others for review. However, the student submission and reviews are not removed from the system (you can, however, erase the content of a submission). You can generate a new join link (and invalidate the previous join link) at any time.